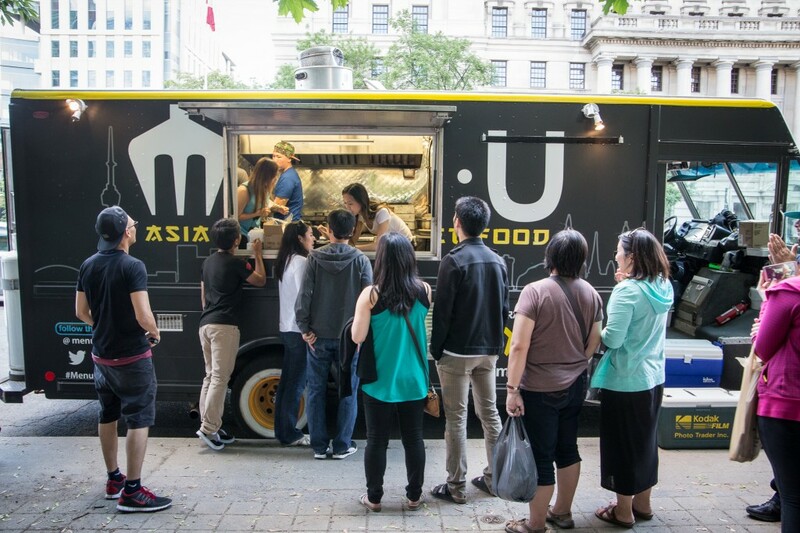 ME.N.U food truck hit the streets this summer after a year of researching, culinary touring and finally field testing that involved; apprenticing with veteran food trucks; travelling to the west coast and Asia for menu inspiration; and building momentum and recognition with Toronto crowds. Blogging the journey to food truck ownership all the while, the pay off for co-owners Allen Tan and Brian Siu-Chong came when they finally acquired their own mobile kitchen, the now defunct Stuft food truck. As if that’s not acheivement enough, the pair is also operating a 400-seat, 3,000 square foot restaurant inside Wild Water Kingdom, the seasonal attraction serving as a commissary and reliable parking spot for the truck. For their freshman season on the road, the truck has obtained the $5000 city-issued curbside license and (without a calendar of regular catering gigs that other more established trucks depend on), ME.N.U is making the most of its ability roam. “I like to park on University between Queen and College for lunch” says Tan sharing this high-traffic sweet spot is far enough from other restaurants so as not to infringe on their territory. On the mobile menu you’ll find and ever changing selection including things like Asian fried rice balls, tacos built on roti shells and poutine smothered in gravy and shredded peking duck. Most popular with the lunch crowds is the combo priced at $10 that offers a choice of two rice balls and a taco. What’s next for ME.N.U is still uncertain though the plan for winter is to operate at the Brampton waterpark as the onsite sports complex stays open year round. Read more about this truck in our introductory post here .